Google announced at its press event yesterday that it has integrated Google Voice technology with Gmail and now users can make voice calls to any traditional phone number (landline) from their computers and also receive incoming calls through their Google Voice number. If you’re a Gmail user and have a Google Voice account, you can now link both and your inbox will be like just another phone line that will ring when someone calls you on your Google Voice number. The option to “Call phone” now appears within Google Chat. When you click the link, a Gchat pop-up appears where you can dial numbers and make phone calls. A Google Voice account is not required though to use the service, but international calls will be funded through Google Voice accounts. Calls to phone numbers in the U.S. and Canada will be free, and will cost 2 cents a minute to several other countries such as France and the U.K. The service is initially rolling out to Gmail users in the US, with international availability coming at an unspecified later date. Google is not introducing the services to mobile phones yet but it’s speculated that it won’t be long before they do that and we may see an Android app soon for the purpose. 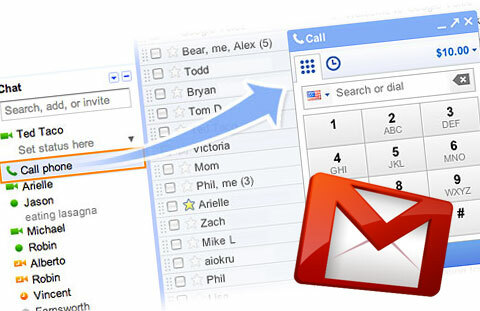 Check out the video that Google released at the event to know all about your Gmail phone line.